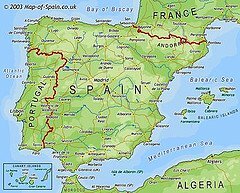 Antoni Gaudi was born in Reus near Salou and La Pineda on the Costa Brava, north east Spain. 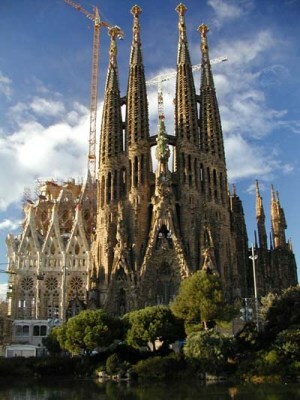 He attended the New School of Architecture in Barcelona and started work as an architect in 1878. One of his first works was on lampposts for the Plaza Real in Barcelona. This was followed by several commissions for altarpieces and furniture of different types, including a showcase for gloves for the Comella company promoting at the Paris Exhibition at that time. 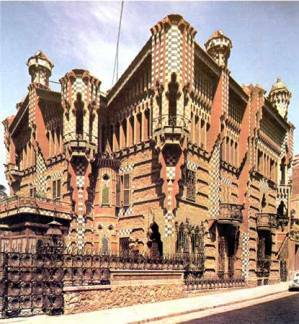 One of his first houses was the Casa Vicens, 1883 - 1885 which had polychrome tiles on the outside walls. 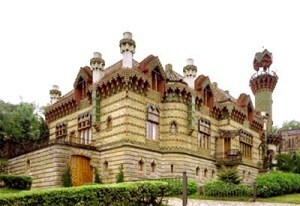 He also did the villa El Capricio in Comillas, east of Santander in Cantabria, see below. 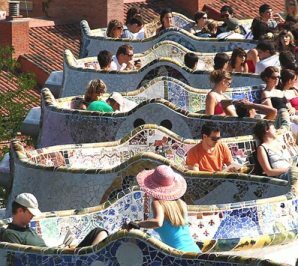 The famous park on Muntanya Pelada (bald mountain) in the north of Barcelona was one of a number of works undertaken for Eusebio Guell, the long-standing patron and friend of Gaudi. 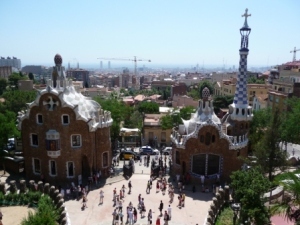 Originally Guell had hoped to develop 60 properties in the area in the form of a garden city. 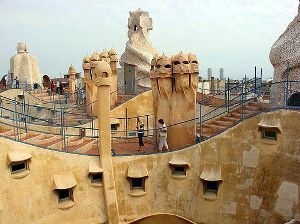 However only 3 were sold, but this didn`t detract from the works which Gaudi created in the park. He planted a whole variety of trees on the sparse mountain, and built the unique viaducts to reduce the impact of the roadways on the landscape. On the perimeter wall there are wonderful mosaics called `trencadis` which were created from broken pieces of tile. At the main gate there are the stunning pavilions with their characteristic egg-shape supported by reinforced ceramic beams and brick vaults and supporting walls. There is also a plaza supported by columns which has the important coloured tile curving bench at one end. 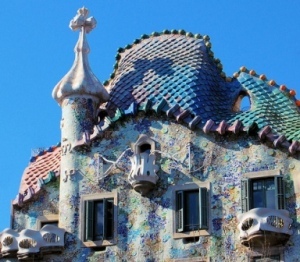 This unusual but typically Gaudi building was built in 1905-10 for a wealthy couple Rosario Segimon, and his wife Pere Milá, after whom it was named. 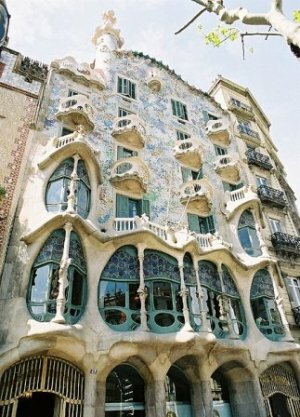 It is one of Gaudi`s most important residential buildings and is packed with design features to blow the imagination. The external profile is a work of art with undulating balconies adorned with sculptured wrought iron work. The interior is a stunning construction of floor landings all overlooking a small courtyard opened to the elements at roof level. Gaudi gathered together an expert group of builders, ironwork specialists and plasterers to create a unique masterpiece. Traditional Catalan brick arching walls support the lofts, and the roof has chimneys with a kind of soldier type design like you`ve never seen before. The current owners have opened the refurbished building to the public, and there is a good variety of cultural events to enjoy throughout the year. The building was recognized by UNESCO as a "World Heritage" site in 1984. Casa Batllo was built in 1877 in Passeig de Gracia and completely re-developed between 1904-1906 by Gaudi and Josep Maria Jujol. Known locally as Casa dels ossos (house of bones) because of its skeletal appearance, it is typically modernist Gaudi design. There is very little in the way of lines or perpendiculars, everything seems wavy and randomly sculpted. The façade is heavily decorated with a mosaic of broken ceramic tiles in garish colours. The roof has the profile of a pre-historic monster with tiles like scales rounded off at the edge with teeth-like guttering. 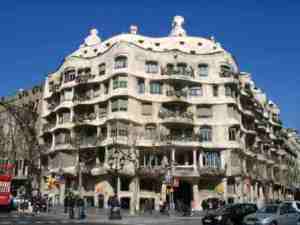 This exciting architectural masterpiece in Barcelona became Gaudi`s life work in his early thirties. The early work in the crypt allowed him to create ideas for the rest of the church. He used the east transept for a presentation of the Nativity scene.Other work continued on the apse, lower towers and entrance. In the early 1900s development began on the upper part of the towers. The new style was emerging with round towers from the traditional square base. The east front towers were completed after his death in 1926. Comillas in Cantabria is home to El Capricho. This is unmistakably another classic Gaudi work. You will recognise his unusual style in this former palace turned restaurant. Ensure you see the rest of the pretty town when you visit. 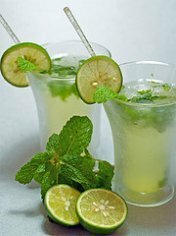 There is a bustling central plaza with some excellent restaurants to suit all tastes. The beach is great as well.